This entry was posted in culturecamp, Uncategorized and tagged Airbnb, artisanal, bad design, Ben Watson, brand of the moment, branding, brands, Brian Walker, Carmichael Lynch, Chief Culture Officer, CPG, creating culture, creator brand, culture, designers, Diana Budds, Fastco, Herman Miller, lifestyle brand, midcentury modernism, Netflix, Nike, PepsiCo, Peter Arnell, Principal Financial Group, storytelling, Subaru, Tropicana, Uber, Wieden + Kennedy on May 16, 2016 by Grant. When Guy Kawasaki was asked how to get internet famous, he had discouraging news. There is no easy answer, he seemed to say. You have to follow thousands of people. You have to reply to all your email and Twitter traffic. Yes, he said, I’m “internet famous” but it took me 25 years to get here. But some people came up easily. The 1990s was the internet’s Cambrian era, so there was an immense amount of noise and commotion. Now that everyone was in the game, it was hard for anyone to rise. But a few did. And some of those few did not appear to be working hard at all. They were not scrupulous about their twitter traffic and email. They got digital celebrity the easy way. So what’s the easy way? Let’s take three case studies. There are several more. But these are three that impressed me most. As the TV show Mad Men as a center piece, Bud began to tweet in the voice of Bud Melman (pictured) as if from the mailroom of Sterling Cooper. He gave us an insider’s view of the agency. The Melman character went from a slender proposition to deep plausibility in the 5 seconds it took us to figure out what the proposition was. Bud (both of them) had insinuated himself into the storyline. He made himself necessary reading for fans of the show. This was fan fic that actually commandeered the original. It was transmedia that was in some ways more interesting and imaginative than the show. (AMC thought so. They came at Caddell with lawyers blazing.) Most of all, Bud showed what digital technology could do. What, in effect, it was for. For the price of a Twitter account (then as now $0), he was famous. With “Bud,” Bud found had found a way to hack old media with new media. The message was clear. Old media might continue to control a big piece of contemporary culture and it would always have more money, more institutional heft, and perhaps more eyeballs, but with tiny investments some people could help themselves to some of the proceeds. It felt like something out of Prohibition, when small bandits managed to liberate one truck from the 100 trucks big bandits were sending from Canada to NYC. Talk about ROI. Bud won fame for the price of a good idea and a really cheap delivery device. Jonah Peretti won fame a different way. He asked Nike to customize his shoes with the word “sweatshop.” Nike refused. An exchange of emails ensued in which Nike insisted that “sweatshop” was slang and therefore forbidden. Peretti replied it was standard English. And then he published the emails. And won himself a piece of immortality. This is one of the characteristics of this fame, that it uses resources that don’t look like resources at all. An exchange of emails as the path to stardom. This was new. And cheap. And forget answering all your email. Just publish the interesting ones. This begins with an act of brilliance. Peretti saw that he could use Nike’s customization for his own purposes, against Nike, and as a way to draw attention to a big issue and indeed a guilty secret that lay at the heart of the Nike proposition. It’s an opportunity right there in front of everyone. Most of us are incapable of anything more imaginative that “Grant’s sneakers” or “Left” and “Right.” Peretti saw a way to hack the customization that Nike felt made them just so very you know current, “with it,” and “on the ball.” The conceit exposed them. Peretti made them pay. There is something so clever about these cases you instantaneously go, “Oh.” Your heart and your head is glad. Previous generations found fame in other ways, writing books, starting companies, distinguishing themselves in some arena or other. (Think of Stewart Brand’s The Whole Earth Catalog.) But all of these were effortful compared to what is happening here. What brought them Caddell, Peretti and Slavin fame was virtually all concept, not much more than a really brilliant idea stretched over a balsa wood frame. It was, and is, path to stardom because this was all it took to demonstrate that you were someone who grasped “it” (the intangible kinds of value and engagement now possible in the digital space) while the rest of us were struggling to get our blogging software to work. Anthropologist like this sort of thing for the same reason that linguistic like puns. We can see the cultural (linguistic) mechanics at work. But I think it’s clear that virtually everyone saw these events, these hacks, as clever as anything and they rewarded the creators with admiration that rose to the level of stardom. And remember how hard this was in the 1990s. Now that everyone was more active and visible, it was hard to see anyone. We want to avoid a post hoc “oh, but that was obvious.” There was nothing obvious about climbing out of the blizzard of invention going on in that cultural moment. Or this one. Some will say, “Oh, but this really isn’t celebrity of anything like the kind we care about. I mean these guys are not film star famous.” True enough. I would argue this is a higher grade of celebrity. If you want to be film star famous, you have to trade away your privacy. You will be followed around by the paparazzi. People will make their living inventing falsehoods about you. This celebrity is costless. Highly profitable but almost entirely costless. We can think of these as “ingenuity bombs” in the manner of a seed bomb. You take a really great idea. Coat it in just enough materials to get it started. And then hurl it into the world. And stand clear. Actually, stand close. You are about to be covered in glory. For more on this idea see my book Culturematic. post script: apologies for the precious version of this post. I am working from Mexico City and my internet resources are constrained. This entry was posted in Uncategorized and tagged anthropology, Area/Code, Bud Caddell, celebrity, culturematic, digital celebrity, Guy Kawasaki, Jonah Peretti, Kavin Slavin, Mad Men, Nike on February 17, 2015 by Grant. A couple of days ago, I speculated on why LeBron is so hated by some sports fans. I suggested that he’s become a target for our animosity for athletes who sell their talents to the highest bidder. Some of the answer he contemplates: admit that he’s made mistakes, give us a history lesson, tell us how much fun we’ve had, and "have my tattoos removed" (image). Poignantly, we see James in an empty room for his Hall of Fame induction and he asks, "should I really believe that I’ve ruined my legacy?" It’s an effective piece of advertising. It makes you feel his pain. At the penultimate moment of the ad, James looks into the camera and you can feel his sincerity. What’s clever about the spot is that it drives us towards an answer for this question. We end up thinking, "Well, James has the right to do whatever he wants to do. Fans have the right to be unhappy. But finally, we don’t have the right to say where he plays or finally who he is." And this means the ad turns, almost inaudibly, on the cry of individualism. This is one of the bedrock convictions of our culture: that the individual has the right of self-determination, of self definition. It’s not for elites to tell us who we are. It’s not for ethnic groups, local communities or corporations. It’s not for parents. Nor for teachers. And it’s not, James is pointing out, for fans. We honor this individualism much more in fact than in theory. But once you see it as a cultural value, you see it everywhere. Just the other day I found it in Andy Grove’s Only the Paranoid Survive. Your career is literally your business. You own it as a sole proprietor. You have one employee: yourself. You are in competition with millions of similar businesses: millions of other employees all over the world. You need to accept ownership of your career, your skills and the timing of your moves. It is your responsibility to protect this personal business of yours from harm and to position it to benefit from the changes in the environment. Nobody else can do that for you. This is a compelling spot because it resorts to one of our foundational ideas. In the face of this value, we defer. Yes, we may resent James for having betrayed Cleveland. But we find this truth to be self-evident: the individual has the right of self determination. Does Nike intend this message? I think they did. 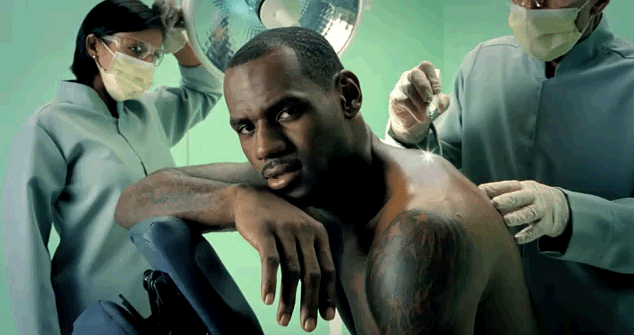 Davide Grasso, the VP of Global Brand Marketing, says the ad is meant to "amplify LeBron’s voice. We’re celebrating his courage to forge his own journey even when others may have disagreed with his decision. It’s this Just Do It spirt that defines LeBron and Nike as we strive to inspire all young athletes." This is the hymn of individualism, note by note. Grove, Andrew S. 1999. Only the Paranoid Survive: How to Exploit the Crisis Points That Challenge Every Company. Crown Business. Location in Kindle text, 201. Henri Weijo for remembering the post and sending me the clip. This entry was posted in Uncategorized and tagged Andy Grove, Davide Grasso, LeBron James, Nike, Wieden and Kennedy on October 26, 2010 by Grant. What does the Marketing 101 tell us about fighting titantic brands? Another option is to play the "intensive" card. The titan is trying to be all things to all people. We try to be one very particular thing for one particular niche. The last is to create a competitor so unprepossessing, unattractive, and dubious that no us takes you seriously…until it’s too late. This appears to be the Skechers strategy. 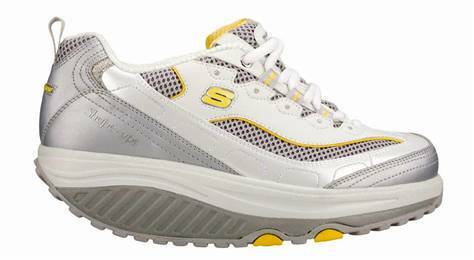 I haven’t done a thorough search, but it looks like Skechers took the low road. Product design, the advertising, naming, the product proposition, they all scream awkward and untutored. Now, of course, this could be an expression of the limits of the Skecher team. But it could be something craftier. I mean, it’s almost as if Skechers is being deliberately gauche. What a good strategy. This is the only way to take Nike on. Talk about a formidable marketing team. Yikes. The chances of competing face to face, well, you’d have to get up pretty early in the morning. Actually, you wouldn’t be allowed ever to go to bed. No sleep ever. And you’d still lose. Not to get too "little grasshopper" about it, but the only way to take on Nike is to use their strength against them. They expect the competition to look like them, to hold to the same standards, to exhibit the same formidable professionalism. So when Skechers comes shambling into the arena in sweat pants and throwing around dubious fitness claims, the Nike people must have said, "Please." It was like a Double A baseball team wandering into Wrigley Field. Clueless was the perfect Trojan horse, the way to sneak into the market without setting off alarms. Again, I haven’t done the research. I am just judging things from the externals only. I mean Skechers stealing a market from Nike. It’s like learning the Bridgeport Bluefish just gave the Yankees a whipping. It seems not just unlikely. I would have said it was statistically impossible. But it is precisely when things are impossible that hidden assumptions give the cunning competitor a way in. Townsend, Mike. 2010. “’Toning’ shoes gain traction.” MSNBC. September 6. http://www.msnbc.msn.com/id/37510162/ (Accessed September 30, 2010). This entry was posted in Uncategorized and tagged marketing, Nike, Skechers, Snapple on September 30, 2010 by Grant. This is a Communist star now tucked between monuments to capital. It was taken from a speeding taxi and I was pleased that I lined it up. The chances of persuading the driver to go back around for another photo, well, these were not strong. The Chinese will suffer many things. Idiots are not one of them. Five things struck me yesterday. 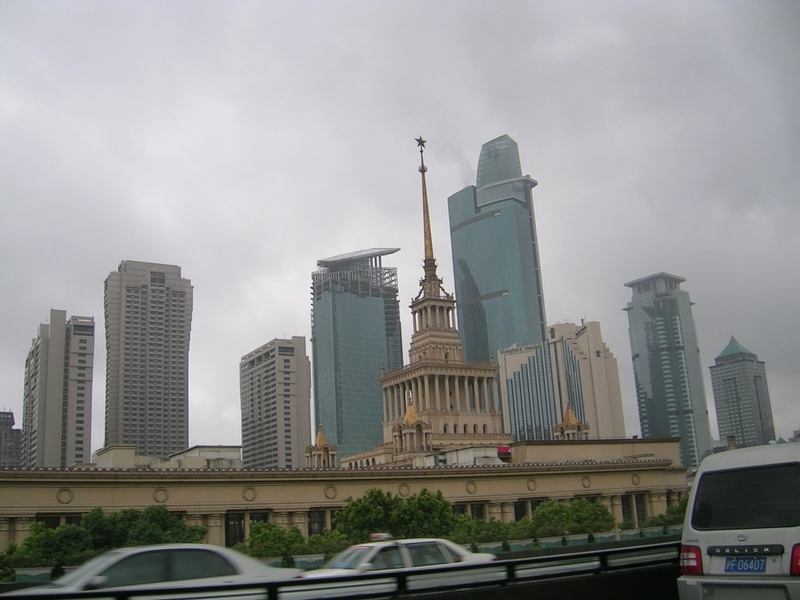 Third, Shanghai is a capital of capital. It’s China’s capital of capital. It can’t be very long before it is the capital of capital, eclipsing even New York and London. Fourth, I am wondering when China will so establish itself as a culture center that we will quite like the idea of buying brands that include or consist of Chinese characters. (I am there already.) When will Chineseness becomes a mark of sophistication, power, connection, or all three? Certainly in my lifetime, unless I am struck and killed by a Shanghai motorist. When does Shanghai become the new Rome? When do I return as a bumpkin from the provinces? Five, none of this comes to pass unless China masters openness. And this week, there were troubling developments on this front. The state declared that it would make itself sole source for information about China, that it would be Reuters with a monopoly on news, that foreign journalists would no longer be able to collect data. Observers, Western and Chinese, rubbed their eyes with astonishment and declared that, among other things, the capital markets would up and leave. Cooler heads prevailed, and Premier Wen Jiabao insisted yesterday that China’s open policy would remain unchanged. Still, this little misadventure in communications tells us that there some do not fully grasp the nature of the enterprise and the secret of dynamism. Talk about a critical path. If dynamism is allowed to flourish, one future, a Chinese future, awaits the species. Another, nonChinese future emerges if that long standing Chinese feeling for control asserts itself. It is one of those “power comes to those who let go” paradoxes. My guess is that the instinct for control is largely in remission. You don’t get this far down the road unless you are deeply committed to letting things rip. This entry was posted in Anthropology of Contemporary Culture and tagged China, Nike, openness, Shanghai on September 14, 2006 by Grant.